I wrote recently about Heidi, the cow who saved herself. That aspect of Heidi defines her to a great deal. Knowing her story, it is impossible to look at her and not feel a sense of awe and amazement. I doubt anyone meeting her now would guess at her hidden depths, at least not of the jumping-out-the-window-to-save-herself variety. Yet, it is unsurprising to learn that she’s showing those depths in different ways now. 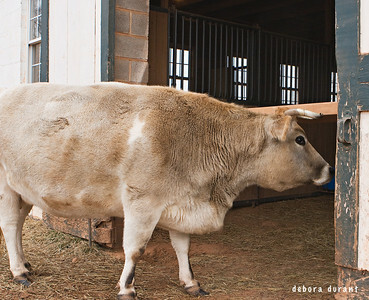 “Heidi, the cow who saved herself” is what she did, it is who she is. “Heidi, the cow who looks after Emily, the blind calf” is what she does now, it is who she is becoming. Almost two years ago a little blind calf came to live at Poplar Spring. As with many of the animals, Emily’s story is convoluted, with several hops and a good deal of fantastical luck. Emily was born on a small local beef farm. She was apparently blind from birth. And this, in the end, saved her life. Of course it almost killed her first. 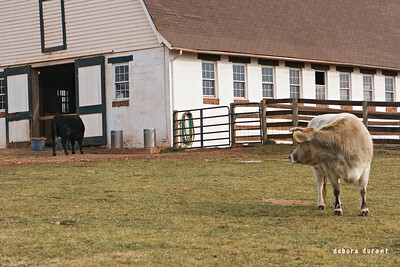 On these small beef farms, the cows are out in the pastures grazing day in and day out. The “breeding females” are gotten pregnant pretty much every year, and their babies are killed at about 18 months old. Until then, the mothers and babies are together. The farmers don’t put much effort into caring for these cows; it is likely they are doing this for tax reasons as much as anything (suburb of DC, hello agricultural tax incentive! ), so for their few head of cattle, they go for the minimal effort. In the cold icy February two years ago, Emily was in the field with her mother, but they somehow got separated. Emily was stuck in some ice, and the employees on this farm noticed and told the farmer. He reacted in a way that is both shocking and unsurprising. “Let her die,” was essentially what he said. This upset one of the workers, especially as Emily and her mother were calling back and forth to each other. Emily was not only trapped in some ice, but she was somehow on the wrong side of a fence. The worker was able to free Emily from the ice. Emily was sick by then, and it was finally clear to the worker and the farmer that she was blind as well. The farmer wanted nothing to do with this sickly blind calf, and he certainly didn’t want her taking up space in his barn. The worker knew of Poplar Spring Animal Sanctuary because she’d brought a chicken there once upon a time, and so she called the sanctuary to see if Emily could find a home. Emily was 4 months old when she came to Poplar Spring, and she was very wary of humans. It was quite a while, and only with the influence of apples, before she would let anyone but Dave and Terry (and some of the regular week-day workers as well) approach her. As is typical with cows, Emily was accepted into the herd immediately. Yet Emily was a bit independent. She’d get lost in the woods. She’d be down by the creek on her own. Likely this is how she got separated from her mother in the first place. She is actually quite good at following and finding the cows, to a certain degree, using the secondary senses of sound and smell to guide her way. She has no fear. However, having a blind cow potentially lost in the wooded areas of the 400 acre property made for some stressful and sleepless nights for the human caretakers of the sanctuary. Terry looked into GPS collars, and was able to raise the money for a couple. There’s a blind horse at the sanctuary as well, and though he is much more cautious and much less independent than Emily, and though he has a partner who wears a be-belled halter so that he can hear her as she moves, there is still the worry. And so GPS collars seemed a good idea. And they were, but unfortunately they were also no longer made, which Terry found out months after she ordered them, and had her money refunded. A couple of us researched with our best search-term skills, and couldn’t find anything workable for this purpose. And so time marched on, Emily adapted more and more, and though she still got separated from the herd, it was getting more predictable. The worry was still there, but so was the confidence that Emily did know how to take care of herself. A GPS collar would have made it easier to check up on Emily, but everyone adapted to the reality, which did not include such a collar. In recent months, Heidi has decided that she is the surrogate momma for Emily. Or maybe not a mother, really, but big sister or mentor of some kind. Emily is stubborn, but of course we know that Heidi has a determined personality. 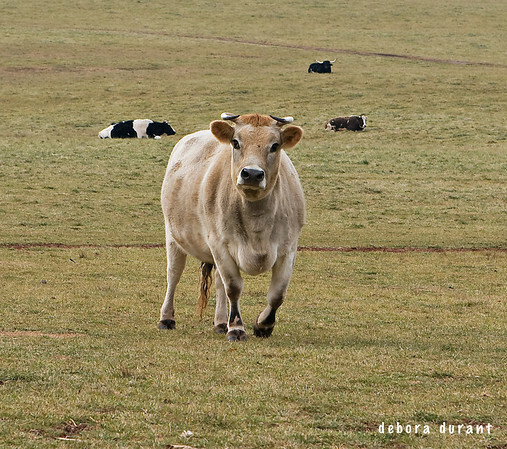 When Emily hangs out near (and sometimes in) the pig barn, and the cows are beginning to move off, Heidi comes back for Emily and moos at her imperiously. Naturally Emily, being Emily, tries to ignore the summons. Eventually, though, Heidi is able to convince Emily to follow her. Ever since Heidi has taken on this new role, Emily has not gotten lost. Emily has not gotten separated (other than to the extent that she insists on by her not-quite-as-social-as-average nature), and Emily is now able to stay with the cows as they wander the whole 400 acres. Emily, as it turns out, does not need a GPS collar. She has Heidi. Wow, interesting how that worked out! The battery length was one of the key factors that made it so hard to find one that would work for Darcy (the blind horse) and Emily. If they don’t last at least a full day, they’re pretty much worthless for these purposes. 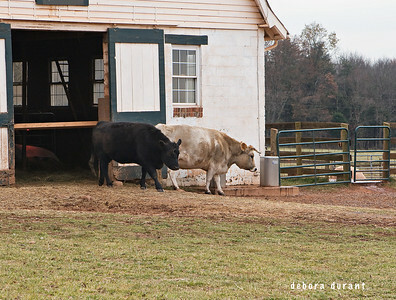 (In the summer, the cows don’t necessarily even come up to the barn area every day, though in the winter they’re usually waiting to get into the horse barn.) There are a lot with battery lives of like 8 hrs that are made for dogs, but that just wasn’t going to cut it. I guess I don’t know enough about how the GPS phones work. (my cell is at least 3 years old!) If it was attached to her collar, would terry and dave be able to figure out where she was by looking at something on the computer, or on another phone, or how would that work out? And does it need to be able to have a good cell signal to work? Lots of variables, but it might be a good potential solution! Yeah, there’s definitely a variety of products out there. I bought one of this. It’s portable. It tells you where your car is by showing you a map. Of course, this is for cars so they show you what intersection your car is on. You use the website to check these things, but under the surface the company’s computers are communicating with the GPS unit using mechanisms similar to text messaging (some even have SIM cards in them). A fully charged battery last me about four or five days when I park above the ground. I no longer use it though, because now I mostly park underground whether for work or my apartment. This drains the battery really fast, because the unit will have a hard time getting satellite and cell tower signals and it’s forced to amp up the power, and retry and retry. In this case the battery is pretty much drained the very next day rendering it quite useless, so I’ve stopped using it. Hm. I know Terry preferred the devices that didn’t have a monthly service fee associated with them. I’m also not sure how well something like that would handle the sanctuary grounds since there are no roads, and regular car gps tends to wig out, certain you can’t drive anywhere that the map doesn’t have on it! lol. The device that she’d found, which is no longer made, was designed for horses, so it was really designed around the purpose that they needed it for, for Emily and Darcy. Still, some of these other devices might work. They’d need a lot of adjustments though – weather proofing, crush proofing…if there isn’t something that would work now, I’m sure given time there will be something that will come out that would fit the bill! I always try to remember to mention when I know the resident came from a small farmer, for precisely that reason. Of course they don’t know the fully stories of many of the animals because many of them were abandoned (or escaped). This brought tears to my eyes! What a great story. Glad you liked it, ARPhilo! I LOVE HEIDI!! GOOD GIRL!! thanks so much for posting this story….. I love it and will send it around..
Pingback: easyVegan.info » Blog Archive » Valentine Piglets & Cow Kisses! I love this story, it just goes to show you that animals do have feelings too and are also capable of giving love in their own way. Just look at what Emily’s doing for Heidi, good girl Emily! @ rae – thanks for the visit, and for sending it around! Care for Cows in Vrindavan (India) maintains abandoned cows, bulls, retired oxen, and orphaned calves. We are international volunteers who offer our talents and resources to tend to the neglected cows living in Krishna’s holy land. 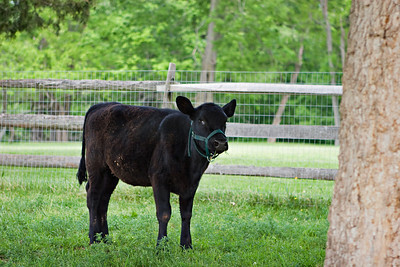 We provide stray cows hay, flour, fresh grass, medical attention and a place where they can recuperate from injuries. At present we host a herd of two hundred fifty. There are approximately three to four hundred abandoned cows in Vrindavan requiring accommodation. Unless they are protected they are destined to subsist on refuse and become plagued by various debilitating and often terminal diseases or suffer injury from careless motorists. However, the most immediate danger is that they become abducted for slaughter by cattle rustlers who are active in this area today. Our present facility is full and there is an urgent need to acquire more land for their protection.Log on to www. careforcows.org to find out more. That does it, I will never again eat another hamburger or make another meat load. That story I believe has changed me. Pingback: V for Vegan: easyVegan.info » Blog Archive » A tale of Karma. i love reading Emily and Heidi’s story, individual stories and together story… it just confirms my recent decision to go vegetarian. thank you. I know this story is dated now, but I Love, Love, Loved it! Deb your words SO resonated with me. Very powerful. You really nailed it. Any updates on the girls?